Timothy Black's first book, Connecticut Shade, a fusion of poetry, prose and play, was published in 2008 and is currently in its second printing from WSC Press. Tim's poetry has appeared in the journals The Platte Valley Review, The Logan House Anthology of 21st Century American Poetry, The Great American Roadshow and Words Like Rain. In 2009, Black won the Helen W. Kenefick prize from the Academy of American Poets for his poem, "Heavy Freight". In 2009, he was awarded a grant to edit and publish Where We've Been and What We've Seen, an anthology of student essays dealing with the experiences of war veterans in northeast Nebraska. He is currently working with Nebraska State Poet, William Kloefkorn, on a book of interviews and portable poetry workshop. 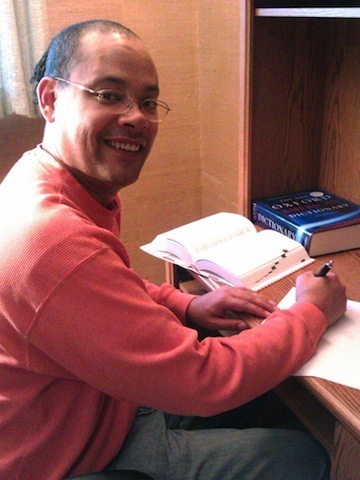 A Cave Canem Fellow, Timothy lives in Wakefield, Nebraska with his wife, author Cynthia Black and two sons, Jake and Titus.